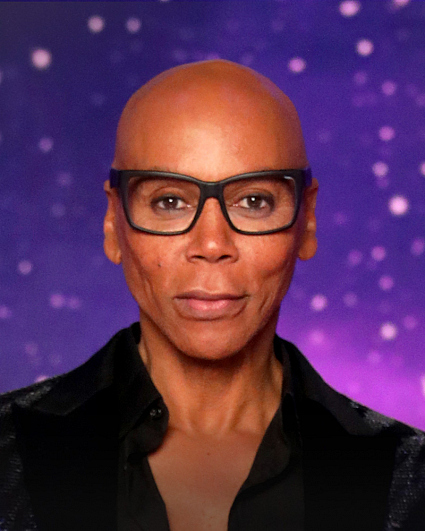 RuPaul Andre Charles is an American actor, model, singer, songwriter, television personalit,y and author. Since 2009 he has produced and hosted the reality competition series RuPaul's Drag Race, for which he received four Primetime Emmy Awards. In 2017 he was included in the annual Time 100 list of the most influential people in the world. RuPaul was born and raised in San Diego and later moved to Atlanta to study performing arts. He settled in New York City where he became a popular fixture on the nightclub scene. RuPaul achieved international fame with the release of the single "Supermodel (You Better Work)," which was included in his 1993 debut album, Supermodel of the World. In 1995 he became the first spokesperson for MAC Cosmetics, raising millions of dollars for the MAC Aids Fund, and becoming the first man to land a major cosmetics campaign. In 1996 he co-hosted the talk show The RuPaul Show and the morning drive radio show on WKTU, with co-host Michelle Visage. As a recording artist, RuPaul has co-written and co-produced 14 studio albums to date, including Foxy Lady, Champion, Glamazon, Born Naked, and American. As a film and television actor, RuPaul has appeared in over 50 films and television shows both in and out of drag, including Crooklyn, The Brady Bunch Movie, To Wong Foo, Thanks for Everything! Julie Newmar, But I'm a Cheerleader, Hurricane Bianca, Broad City, and Girlboss. Currently, he is in production for the Netflix series AJ and the Queen. RuPaul's Drag Race has produced 10 seasons to date and has inspired several spin-off series, including RuPaul's Drag U and RuPaul's Drag Race: All Stars. Also, he is featured as a host on the series Skin Wars: Fresh Paint, Good Work, and Gay for Play Game Show Starring RuPaul. As an author, RuPaul has published two books: Lettin' It All Hang Out and Workin' It! RuPaul's Guide to Life, Liberty, and the Pursuit of Style. In October he released his third book, GuRu. RuPaul is noted among drag queens for his indifference toward the gender-specific pronouns used to address him—both "he" and "she" have been deemed acceptable, as stated in his autobiography: "You can call me he. You can call me she. You can call me Regis and Kathie Lee; I don't care! Just as long as you call me." RuPaul's birthday is Nov. 17. Follow him on Twitter @RuPaul and Instagram @RuPaulOfficial.